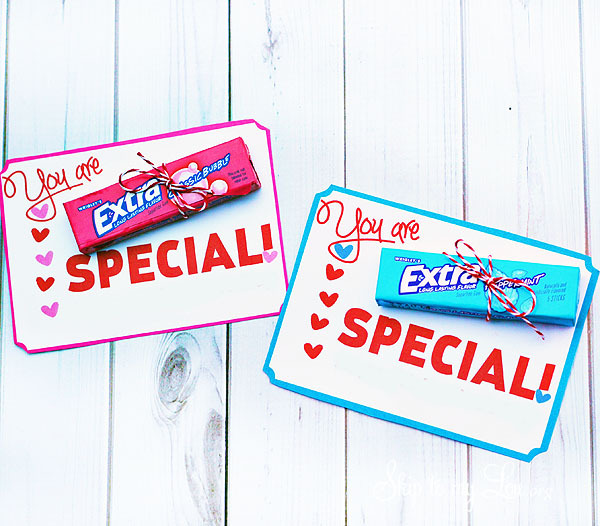 This extra special teacher gift is a super last minute way to brighten your teacher’s day. If you are looking for more ways to thank a teacher don’t miss these teacher appreciation ideas. Here are 100 great ways to thank a teacher and 50 cute sayings for Teacher Appreciation. Download and print the cards in color on white card stock. Cut out the cards. Tape or glue a package of gum to the card. You can dress of the gum with a bow before attaching to the card if you like. Finished. This little token should make your teacher feel special. If you are looking for more quick and simple ways to thank your teacher you might enjoy the cutest printable teacher appreciation gift tags (many work for non-teachers too!) Just print, cut and attach to a small give to show your teacher how much you appreciate their hard work! See more of the printable tags here.